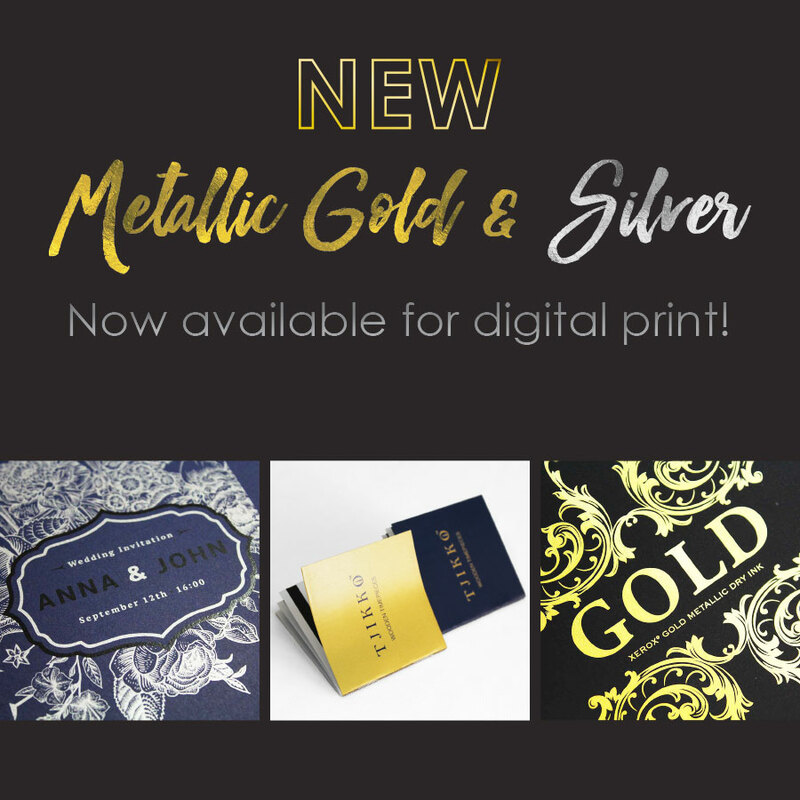 Previously only possible as part of a high volume litho print run, printing metallic gold & silver is now possible as part of a short digital print run. The most notable advantage of this, is being able to apply metallics to small custom runs of invitations; certificates; business cards and other promotional material without breaking the bank. In addition to that, actual proofs are now possible because with digital printing, you can print as little as one sheet at a time, plus ‘what you see is what you get’, in terms of the proof versus the end result so you will never have to face any unwanted surprises. Mock ups for litho print runs can now be produced to show actual metallic gold and silver, swiftly and cost effectively. The ability to print one at a time also gives all you creatives among us the opportunity to experiment and play with different combinations – something that would have been extremely costly and time consuming in the past. We have been doing quite a bit of our own ‘playing’ and have produced some amazing results by combining metallics with different colours, and experimenting with different substrates. We are now also able to print onto dark and tinted papers with great success as the metallics have excellent coverage. Now you can add some sparkle to your certificates and annual reports; business cards and brochures, and still print only what you need, when you need it. Simply set up your metallic gold or silver as a spot colour and we will do the rest. Chat to us if you have any questions, and do ask to see samples if you are in the area – we’d love to show you what we’ve tried so far and look forward to seeing what you bring us in the future!